The Quantum Bias is the fourth entry into the revived Quantum line for Brunswick. This solid white ball features the new Quantum Mushroom High RG Asymmetric core shape, making it the first of the four new Quantums to feature an asymmetrical weight block. The coverstock on this ball is ECA-XR, which is a reactive solid formulation that comes out of the box sanded at 500/1000 SiaAir. 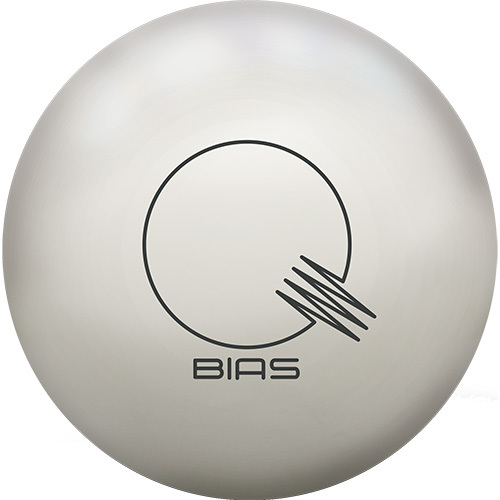 The Quantum Bias tops the hook scale for Brunswick balls making it a no-brainer on heavy volume lane conditions. Possibly the most unique release in bowling this year for multiple reasons, the Quantum Bias. The Quantum Bias is an all-white ball with black logos that stands out like no other ball on the market. This isn’t a gimmick though, this ball performs. This is the first asymmetric Quantum and consistent with previous Quantum releases features 3.5 times more coverstock for increased durability and hitting power. One reason for the all-white color is the traction additive found in our exclusive white pigment that enhances the hook characteristics.